The editorial team comprises of young, youthful and vibrant individuals, with Kelvin "coast" Kodu leading the pack as the publisher. 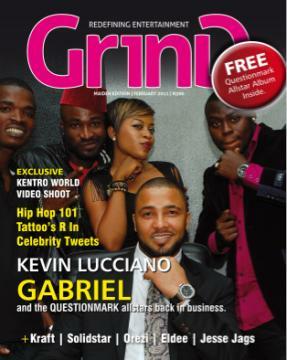 In this maiden edition, Kevin Luccaino Gabriel and the Questionmark allstar's - consisting of Maestro Producer and recording artiste Harrysong, duo of d’Supremes and Model turned singer Ego Omalicha features on the cover and we mirror on the re-emergence of the groundbreaking and renowned global brand, Questionmark Entertainment. Also, There are bumper and exclusive interviews with Mr Super Amazing: Orezi, Kraft, Solidstar, Wudi Awa, Eldee, Producer extraordinaire Jesse jags and many more.. An exclusive compilation CD of music from the Questionmark All Star is also included in every magazine purchased. Grind Magazine is a bi-monthly magazine with a mission to deliver interesting read, loaded with relevant content to keep her targeted youthful readership engaged till the last page. The magazine has already been tipped as one of the emerging forces to look out for in 2011, and there is a promise by the team to deliver outstanding issues after issues as consistent as possible.